First off, I’ll explain U.F.O. Unidentifiable- Unable to be recognized or described. For eg. azodicarbonamide. Food-like- Edible substances or chemicals that are not whole or real foods and are probably harmful to health. Options- Because you have the choice to educate yourself, read food labels and make informed decisions about what you consume. Why do you want to avoid UFOs? When you eat chemical laden foods full of preservatives and artificial flavors and colors, your body does not recognize these as nourishing substances and is unable to assimilate them to provide energy, develop cells and other biological functions. These UFOs stress the kidneys because the kidneys have to work extra hard to process and eliminate them. Many of the UFOs remain undigested in the colon and can cause a variety of negative reactions in the body such as brain fog, lethargy, bloating and weight gain. You may also end up eating even more because they usually do not ease hunger and some of these substance are as addictive as illegal drugs. How you can avoid UFOs: Here are two simple steps. They may not be easy depending on your current food choices but they are simple. Eat foods that do not come packaged such as fresh fruits and vegetables and foods that are the only ingredient in their package such as brown rice, oatmeal, quinoa, seeds and nuts. Select packaged foods that have a maximum of 8 ingredients….. that you recognize and can pronounce. I’ll talk a bit more about the second point. When reading food labels we have been conditioned to focus on calories and grams of fat, carbs and protein. This information is helpful to a degree. Start looking at the actual ingredient list too. I’ll argue that this information is way more important to read and understand. Some of you may know to limit or avoid foods that have sugar as one of the first three ingredients listed because the most abundant ingredients are listed first. Manufacturers have gotten clever. What some now do (especially on foods that are marketed as healthy) is use multiple sweeteners such as cane sugar, dextrose, maltose, corn syrup, sucrose, fructose etc. in one product. Collectively ‘sugar’ is the top one or two ingredients but individually, each form of sugar used in a smaller percentage so these ingredients appear in the middle or end of the list and then the consumer thinks, ‘this is healthy and low in sugar’ Don’t be fooled! 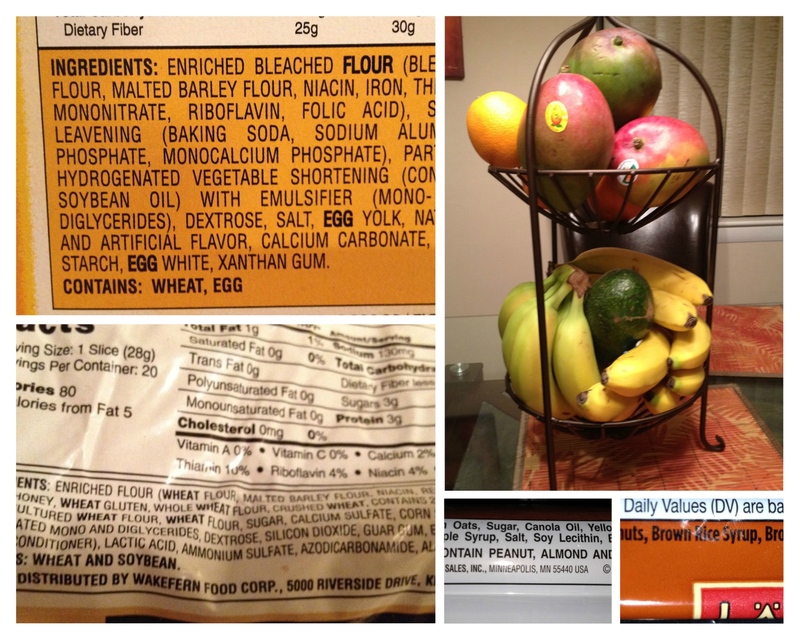 Which of the photos below are real food and which ingredient lists contain UFOs? It’s not about being perfect. Try to at least be aware and avoid UFOs and added sugar when you can and to make progress each day and week towards eating whole and real food. If you’re up for a challenge avoid or significantly limit UFOs for at least five consecutive days and take note of what differences you experience in the way you feel and look. I’d love to read your comments. Let me know how it went.